Again today it was ugly and gloomy, less rainy than yesterday at least. Daddy was on his way to the fish market in Syracuse quite early this morning and brought back nice treats for our weekly meals. He found some more fresh sardines, some calamari and a special treat, fresh Mediterranean tuna steaks. Mommy doesn't eat much fish but fresh tuna is among the few she likes, especially cooked the way I am going to show you. As side, I needed a starch (since I am in a no bred period) and spotting an half used package of polenta cornmeal, while reaching for it I saw also that mom had bought some saffron. 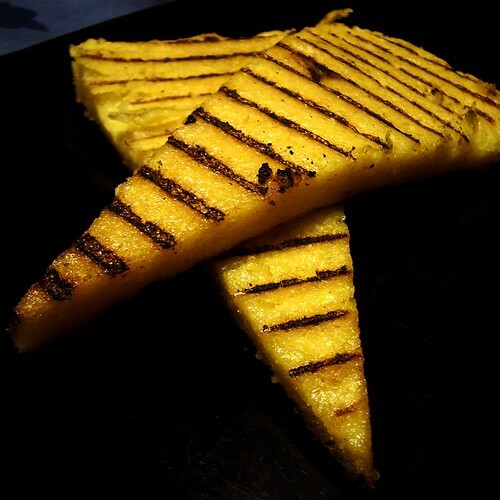 So my side dish was set: grilled saffron polenta wedges. To peel the tomatoes, bring a big pot of water to a roiling boil and cut a cross on each tomato at the opposite end of the stem, you have only to go just across the skin. 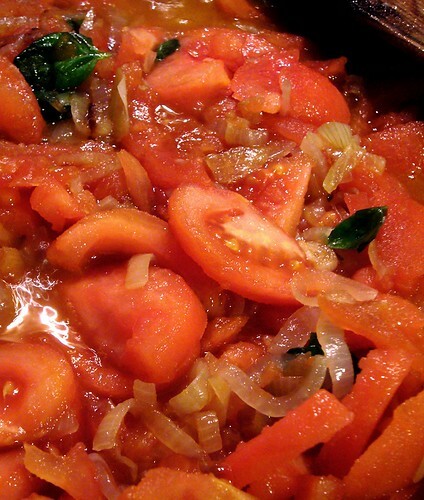 When the water will be boiling, drop 3-4 tomatoes at a time in the pot and let them blanch for 20 seconds or so. Take the tomatoes off the water, let them cool down enough to handle. Thanks to the blanching, the peel would have detached from the body of the tomato o you can simply peeling them by pulling the peel off with your hands or using the dull side of a knife. When all the tomatoes will be peeled, take their stem end out, cut in half and then in slices. 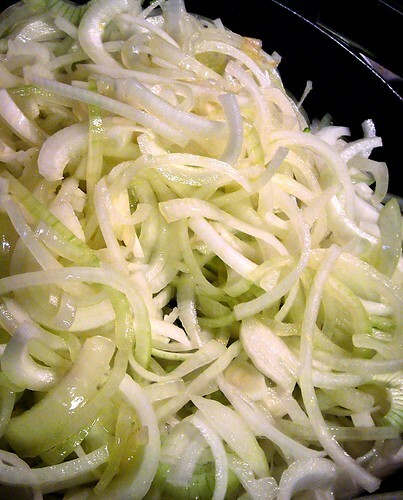 In a big pan, warm up the olive oil and start adding the sliced onions little at a time so they start softening but not stewing. When they will all be soft, add the chilies and the tomatoes. Stir, bring them to simmer and cook covered, on low flame, for 1 hour or so or until the tomatoes will be cooked through and soft. At this point, plunge in the tuna steaks covering with the sauce, sprinkle them with some salt; bring to the simmer and poach until cooked for 10 minutes or so. 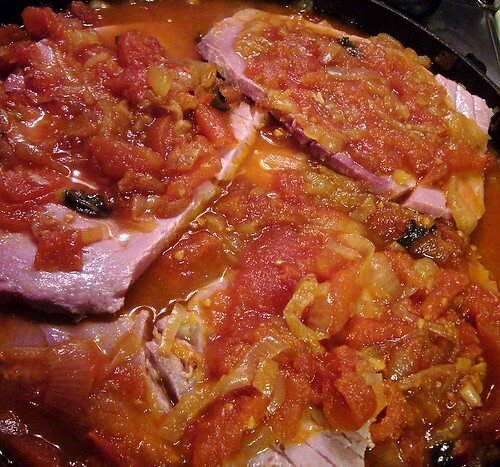 If the sauce results to watery, reserve the tuna on plate and keep warm while you reduce the sauce. Season with salt, fold in the hand thorned basil leaves and let infuse for 5-10 minutes. When ready to serve, warm up the tuna in the sauce and serve drizzled with a little bit of fragrant olive oil. Saffron (I used 1/2 little bag of the preportioned one, I guess 1/8 tsp should do). Check the polenta package for the proper instruction but usually you will have to bring the water to a boil, salt it, add the saffron and stirring carefully the polenta flour in a smooth flow. Pour the polenta in an oiled surface or over a non stick surface (like baking paper) and spread it into a disk of roughly 1cm (1/3") of thickness. Let it cool down completely. Once come to room temperature, the polenta will harden and it will be easy to cut it in wedges or bars that you will oil slightly. Warm up a stovetop grill and grill few chunks of polenta at a time. Turn the polenta chunks when you will have nice marks on them. Surprisingly, this saffron polenta develop a delicate almond aroma that fits very well with the sweet tomato sauce of the tuna steaks alla Siciliana. I want this - NOW!!! !